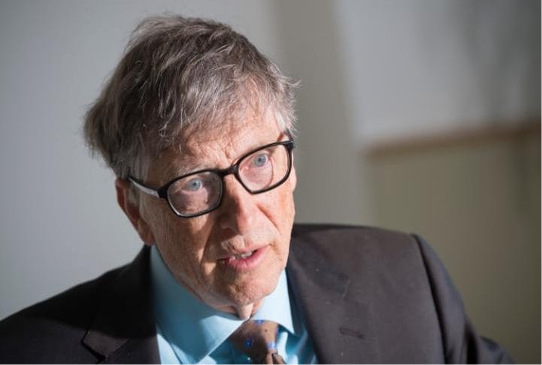 The Microsoft founder urged the UK to keep spending at least 0.7% of national income on foreign aid, saying it was proof of its goodwill and humanity. Theresa May has refused to say if she will retain the spending pledge in the Conservative's election manifesto. But the Scottish Tory leader pledged her own "absolute" commitment to it. More than £12bn was spent in aid in 2015. Some newspapers and Conservative MPs argue the figure is too large and too wasteful, and some of it would be better spent on schools and hospitals in the UK. At a speech in London, Mr Gates said Mrs May had made it clear during her visit to the US in January that she saw the 0.7% aid commitment as a "critical pillar" of Britain's foreign policy. "Britain should be praised, not ridiculed, for sticking to this commitment," he told the Royal United Services Institute. "It was a well-considered decision that sets an example for other wealthy Western countries. It also is visible proof of the UK's goodwill and humanity. "Withdrawing aid would cost lives - which is reason enough to continue it," he added. "But it would also create a leadership vacuum that others will fill, undermining the UK's influence in these regions."